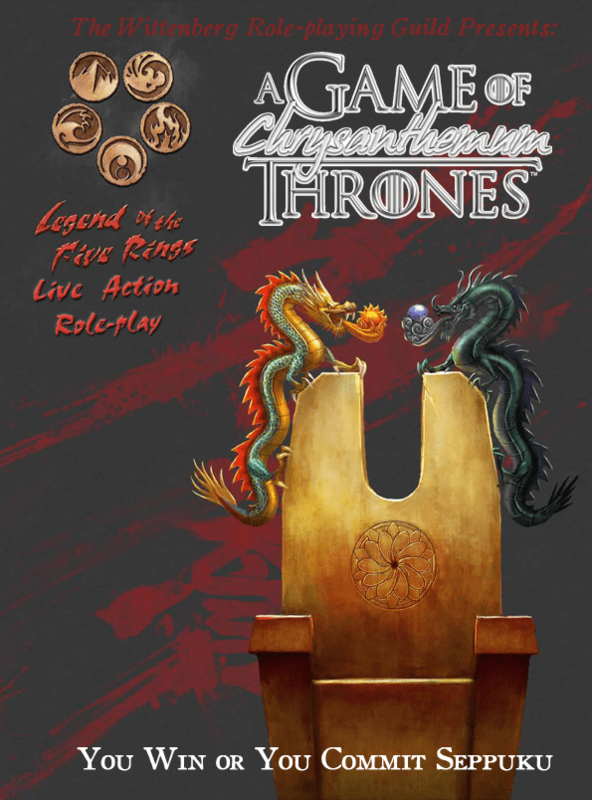 For my next roleplaying game campaign, I’m writing the foundation for a social drama campaign that I’ll then pass off to a co-GM who does a much better job at portraying Non-Player Characters and figuring out the logical (not just conventional) implications of choices. I lamented on social media that writing up the campaign so that someone else can take it and run with it is much more challenging than writing up a traditional, linear story adventure. This post deals with my approach to tackling those difficulties and provides tips for prepping social drama campaigns in general. By “social drama campaign,” here’s what I mean: a campaign where the actions/achievements (drama) of an in-network of people (social) are the primary source of conflict. I would compare the social drama style to the types of campaigns where the source of conflict is external to the social networks the PCs belong to: an invasion force or an inhuman threat, such as monsters, nature, gods, or magic. Most dungeon delves wouldn’t qualify as social drama campaigns, nor would the types of quests revolving around the pursuit or destruction of a MacGuffin. Social drama campaigns would look like the Game of Thrones or Vikings TV shows. “Intrigue” and “politics” and “relationships” are their keywords. They would not look like The Lord of the Rings movies or the original Star Wars trilogy, whose keywords are more along the lines of “quests” and “adventures” and “heroes.” Interestingly, I would argue that the Star Wars prequels resemble a social drama–based campaign much more closely. Of course, you can easily have arcs within a social drama campaign that feel more like the other types, or arcs of social drama within a regular campaign (such as the Wicked Eyes and Wicked Hearts quest line in Dragon Age: Inquisition). Without further ado, here are my top five tips for how to write, prep, and run campaigns or adventures heavy on social drama. Conflicting desires underpin the social drama campaign. The overarching plot can be summed up as the struggle between what the PCs want and what the antagonist wants. These desires can be the same (both want to be king) or different (PCs want to protect the world as it is while the antagonist wants to change the world). In a more competitive style of game, the PCs can take on the role of the antagonist for each other. As the GM, you’re typically responsible for coming up with the desires of the antagonist(s), but it will help if you have a good handle on what the PCs want first. The PCs’ desires, more than their backgrounds or race/class choices, should be the first thing the players address when creating their character concept. It helps with party cohesion if the PCs all have at least one shared goal. The GM might think of one ahead of time to serve as the elevator pitch for the campaign, such as “You’re all samurai serving your lord. If you fail your lord, your lives are forfeit.” This shared goal, more than coincidence or physical proximity, provides the reason why the PCs have banded together as a group. Beyond this shared goal, each PC may have individual goals that align or clash with their party mates’ goals (depending on the group’s tolerance for intra-party conflict). Hillfolk, powered by the aptly named DramaSystem, does a great job of encouraging this during character creation: not only do you determine what your PC wants from the other characters (both PC and NPCs), but each player assigns their PC conflicting identities or internal desires, called dramatic poles. A player can get a lot of social drama mileage out of roleplaying how they vacillate between dramatic poles, e.g. whether their PC remains a selfless protector or becomes a cold avenger. The job of the GM (and possibly the players) is to devise the scenarios in which the identities are tested and a choice must be made. The lead-up to and the consequences of that choice are also pieces that the GM can plan as part of their session prep. We’ll talk about this more in Step 4: Avoid Clear-Cut, Easy Choices. Once the party goals are known, the GM has the basis for the antagonist(s). Next, the GM will need to dig deep into the antagonist’s motivations as well as their flaws and the external obstacles that keep them from achieving their goal (besides the PCs). You should encourage the PCs to build in flaws and external obstacles for themselves also, alongside their desires. This basic character questionnaire can serve as a template, and for antagonists there are plenty of other online resources. The AD&D 2nd Edition Complete Book of Villains includes a fantastic set of interview questions for villains and their minions. So far your prep consists of the PCs and at least one antagonist, but my preference for in-depth social drama campaigns involves more—many more—characters. With each character added to the cast, the game will feel less intimate and become more complex to run, but it has the potential to feel truly epic in scope (see also Game of Thrones!). For me, the larger cast list feels more realistic, and it also gives me tremendous flexibility to create new story arcs and create connections on the fly. There are three ways you can start fleshing out your cast list. First, start out with the characters who can most help or hurt the PCs and the antagonist as they pursue their respective goals. For the antagonist, delegate out proficiencies and duties; very few people can be good at everything, and in most cases, people have one or two areas of expertise. Antagonists will therefore need lieutenants and possibly minions to cover their bases, and in the process they’ll gain rivals and have known people who shaped their personalities and desires. The Player Characters will also have allies, rivals, and obligations. Where similarities in role, personality, or proficiencies arise, you can ask yourself whether two characters from two PCs’ questionnaires might become one and the same, thereby creating additional bonds between the PCs. It’s a good idea to get the consent of the players in question first, unless you have a good rapport with them and think it would enrich the game (read: make it more fun) if that were revealed during play. Second, you can start pulling from the list of characters who are part of the PCs lives. Go ahead and mine the questionnaires your PCs filled out for you to compile a list of characters and concepts. You can also think about people the PCs would have interacted with over the course of their lives: relatives, teachers, students, bosses, coworkers, employees, comrades-in-arms, and so on. These characters might not be the ones to help or hinder the PCs’ immediate goals, but they can become part of what’s at stake to heighten the drama. Finally, you can round out your cast by considering the inhabitants of the location or locations where the story is likely to take place. If the story takes place in a castle, the stable master, stable hands, servants, guards, and so on are likely to make at least cameo appearances. Since they frequently interact with the main characters, it seems likely that they will have their own opinions of or relationships with them. In a city, your list would be filled up with merchants and artisans, local leaders, the aristocracy, and municipal workers. Do some research if you’re not sure who else would feature in your setting. Keep in mind that not every character need be incorporated into the plot, but if their aid might be requested by one of the parties at some point, you can consider how they got involved and whose side they’d be on. Armed with a cast, the GM needs to devise for the antagonists and major recurring characters some sort of scheme that will unfold in an expected manner until the PCs get involved. The plot of a social drama campaign “advances” whenever the PCs take a step closer to or father from achieving their goal, but the plot also advances when the antagonist or other competing NPCs take steps toward their goal that force the PCs to react. Again, start with the main antagonist. Figure out how their desire can be broken down into multiple achievable action items or objectives. These objectives should involve the cast you created previously, either by making use of lieutenants and minions or devising ways to thwart the PCs’ allies. Keep in mind how much time might be required to complete each objective and whether physical components are involved. What you should end up with is an outline that resembles a timeline. In planning for the beginning of the campaign, you’ll need to figure out at what stage the PCs enter in (the scheme might stretch back days, months or even years) and how and when the PCs will become aware of the antagonist’s plans. You can repeat this for other recurring NPCs in the campaign as well, especially if you want to have multiple arcs, multiple antagonists, or just a very epic-feeling game. Beware creating game plans for characters whose desires don’t intersect with the overarching struggle of the campaign in some manner. These are your red herrings, which can be fun for a while, but need to be used judiciously. Since the social drama campaign is more or less a social sandbox, it’s important that the PCs have a good understanding of what they need to accomplish in order to realize their goals. This will give them direction and keep them engaged in the campaign even if they manage to avoid stumbling on the antagonist’s scheme. It’s possible to create a campaign that revolves entirely around trying to thwart the antagonist who always stays one step ahead, and it might feel thrilling and desperate for a while, but if the PCs don’t get to steer the action at any point, soon you might have a group of players who feel powerless and frustrated. One of my tips in developing the game plan is to keep change in mind—you can bank on it, even. The campaign will lose momentum if NPCs and PCs remain static in their desires, beliefs, knowledge, social standing, and so on. Whenever characters interact, their existing game plans have the potential to shift or change entirely. As the characters achieve their objectives, new short-term goals develop, characters change sides, or a surprising new piece of information recasts the dynamics of a relationship. And it’s not just the consequences of these changes that are entertaining, but the pivotal moments of choice themselves. If part of the drama stems from how the PCs react to their antagonist’s scheme, and vice versa, the options they have to choose from shouldn’t be simple or meaningless. I’ve been playing a lot of great video game RPGs lately, and I think Dragon Age: Inquisition does this well, and Witcher 3 might do this even better. The big choices in those games don’t revolve around merely choosing between stopping the villain or letting the villain go when it’s clear that you as a player want to stop the villain. The jaw-dropping moments in the story stem from the choices in which you’re forced to punish or forgive someone, decide who should bear the curse that comes with a great boon, or determine whether you should save the innocents at the expense of your own goals. There are, in my view, three basic ways to create agonizing choices. First, you can present two alternatives that both fulfill the character’s goals but whose consequences align with different ideals or beliefs. Second, you can present one choice that fulfills the character’s desires but does so in a way that comes into conflict with one of their ideals or beliefs; the other choice allows the character to maintain that ideal but fail to get what they want (for now). The last method is to present two bad scenarios, neither of which allow the characters to achieve their goals, but whose consequences differ in terms of which ideals or beliefs are upheld or destroyed. For the first and third options, it’s most impactful if each option presents an ideal or belief that the PC holds, but they can only choose one—one ideal must be forsaken or sacrificed. Of course, you can mix and match all three to create multiple branching-off points for the decision. Part of why I love the Legend of the Five Rings RPG setting so much is because these sorts of choices are built into the setting via Bushido, a somewhat contradictory set of tenets. When duty, honor, and justice all demand you act in a different way, and each action comes with very real consequences, the story unfolds to be truly dramatic. In a more linear, complete-each-chain-in-the-quest-or-fail type of adventure, the GM has less to prep because they can usually predict which option their players are going to choose. But when you present choices that truly challenge the players’ desires and ideals, you’ll need to either plan for every outcome or be willing to improvise. Another way to add complexity is to give your antagonist admirable or sympathetic traits. Now, the PCs and the antagonist might have common goals, or beliefs and ideals they can agree on. This adds a new dimension to the types of options you present to the party. Will they reconsider their goals once they understand why the antagonist is acting the way he or she is? Will the PCs choose to help the antagonist if it helps them achieve their goals as well? Or will they shoot themselves in the foot in order to thwart the antagonist also? Your players will love to hate you if you start pulling stuff like this in the campaign, so make sure it feels tonally or thematically appropriate for the genre or setting, or warn them first. At this point in your planning process, you should have a cast of characters and a list of their desires, beliefs, flaws, and fears; some characters will have fairly elaborate game plans as well. And while some of these traits and game plans might form connections between them, it’s hard to navigate all this information when they’re presented as disparate paragraphs on a page. For social dramas to really feel social to me, the characters need to be connected in some way, or belong to a network. In my games, this network typically manifests as a court or a clan. There are infinite types of things that can connect two characters, but here are some categories to get you stated: love, family, jobs, goals, skills, and information. You started brainstorming this already as part of the cast list (Step 2) and game plan (Step 3). A relationship map or web gives GMs cues for what disposition a character has toward another, what they know about that person, and what power they hold over them. The game sessions in a social drama campaign aren’t usually scripted series of encounters that entail going to different locations. Rather, the sessions play out as an organic string of social confrontations in which PCs try to get what they want, find out what they need to do to get what they want, and then try to do those things. I recommend Scapple if you want to work with something on your computer, but there are other free brain-mapping tools available on the internet, not to mention a good-old pencil and piece of paper. List the details that are most important to know at a glance, and then refer to the stat blocks, character write-ups, and game plans for all the specifics. 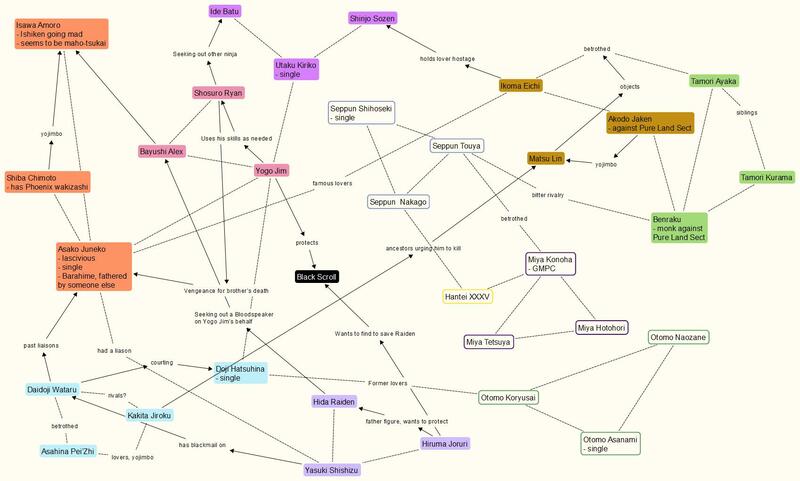 Here’s an example character map (built using Scapple) from an L5R social drama one-shot adventure I’ve run in the past. It takes place at a Winter Court at Shiro Yogo (which is a terrible place to hold a Winter Court, all things considered, but it provides a compelling and interesting hook/object of desire). The main struggle is that (most of) the PCs know that there are certain parts of the castle that are off-limits, period, and need to be protected from the other guests. One of the PCs, as well as one of the NPCs, wants to acquire the Black Scroll, for various ends. Everything else that happens (besides red herrings) relates to this struggle. When I ran it as a Live Action Roleplay in November 2012, most of the NPCs were PCs. In addition to this map, my prep material consisted of the stat blocks for major NPCs (for minor characters, I’d make up stats on the fly and write them down so I’d stay consistent) along with their character write-ups (such as flaws, desires, etc. ), and finally a timeline of events (my game plan). The session began with the PCs getting introduced to the characters, some of whom they had met or knew about before. At a pre-determined time in the session a guest was murdered. It’s possible for the PCs to witness the murder or even be the first ones on the scenes; regardless, as servants of the host they’d get pulled aside to help determine who murdered the guest and why (a new goal, in addition to their existing goals). Then of course, other things started to go down as I went through the rest of my game plan, some of which had already become altered by the circumstances. It was very sandbox-y in that the players could more or less go where they wanted and talk to whom they wanted whenever. However, I also had my game plan for what the villains were up to, the fallout from which would keep the action moving if the PCs got stuck or lost. As you can see, creating a social drama campaign can be a lot of work, but for players whose main thrill is roleplaying or who like to get deeply invested in character relationships, the payoff is tremendous. What are your tips for running a campaign heavy on the social intrigue or political side of things? Love the relationship web! Need to see it in more games. In 2016, I still can’t believe that networks, especially human networks, haven’t caught on in storytelling. In my stupid game, I actually *teach* how to do social network analysis, including visually mapping out human networks with nodes and links and identifying important actors in human networks (the actors with the most links or the actors who are brokers between subgroups). It’s a product of studying WAY too much intelligence tradecraft, but also is a framework for managing the types of complex social webs we come to expect from many-character / multi-generation dramas like Game of Thrones, or hell, Les Miserables.